I doubled this brownie recipe to bake in a 9x13 inch pan. It's a basic one-bowl recipe, which is one thing to really love about making brownies. That, and the abundance of chocolate involved! I added a little peppermint extract and some espresso powder to the recipe. In about 25 minutes or so, they were ready to be pulled out of the oven (you want to still have moist crumbs attached to a tester). 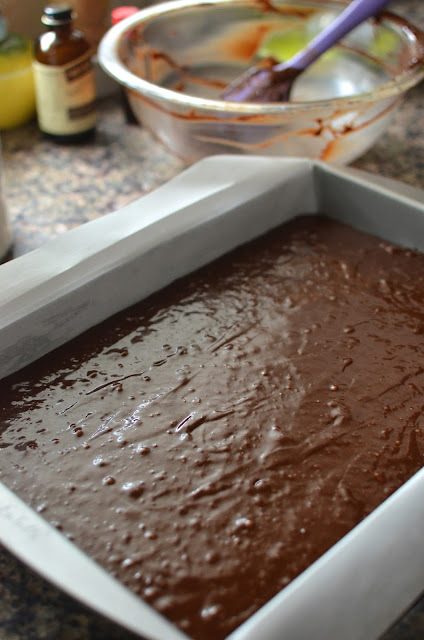 The trick is to let the brownies cool in the pan a bit - enough so that they don't melt the peppermint patties we put on top but still warm enough so that the patties will soften and adhere to the brownie top! I waited about 15 minutes only (instead of the 25 minutes suggested in the recipe) because I was worried about the brownies getting too cool. I might have jumped the gun a bit. I think I could have waited another 5 minutes or so but it's really a wait-and-see kind of situation that you have to make a judgement call on. I laid the patties on top of the warm brownies, lightly pressing them down. In a bit, I noticed the chocolate around near the bottom of the patties melting a bit. The tops of the patties also got a little shiny (i.e., it was melting). I just left it alone and let the pan sit at room temperature to let the whole thing cool and harden again. But before the top totally hardened, I put the candy eyes (which I bought at Target but you can sometimes find them at craft stores) on and pressed those into the top of the peppermint patty. If your chocolate isn't a little wet like mine was, you can simply use some icing to "glue" the eyes on. Now, I let the whole thing cool to room temperature before slicing them into squares and using icing pens to draw on the mouths. I think that was pretty easy! Taste-wise, I was very happy with this recipe. The brownies were moist and fudgy, with a good height on them to give you a hearty bite, packed with solid chocolate and peppermint flavor. I call this a tasty and fun way to get into the Halloween spirit! Preheat oven to 350 degrees. Butter (or spray with cooking spray) a 9x13 inch baking pan, line it with parchment paper allowing for about 2 inches of overhang on two sides. Lightly grease the parchment paper. Melt chocolate, butter, and espresso powder (if using) in a bowl set above a pan of just simmering water. Remove bowl from the pan and stir in the cocoa powder and sugar. Whisk in the eggs, one at a time, beating thoroughly with each addition. Whisk in the vanilla and peppermint extracts. Stir in flour and salt until just combined. Pour batter into prepared pan, smoothing the top. Bake until a tester inserted into the brownie comes out with a bit of moist crumbs, about 25-30 minutes. Avoid over-baking. Set pan on top of a wire rack and let cool for about 20 minutes. While the brownie is still warms (but not hot), lay peppermint patties on top, lightly pressing each down. Let cool for about 30 minutes, then decorate with candy eye balls. If the eye balls do not adhere to the peppermint patties, use a little icing to "glue" them on. Let cool completely (you can speed up the process by placing the brownie pan in the refrigerator) before slicing into squares. Use icing pens to finish decorating the faces. These brownies are so adorable. I love how simple yet fun the decoration is. This is such a cute, fun idea! A little way to get into the Halloween spirit...thanks! There are so many rules now, including no food at any class parties. So different from when I was growing up and I looked forward to all the cookies and cupcakes! But there are a few outside of school bake sales like this one. These were cute and my son is crazy for peppermint brownies so he's loving it...Bring on the holidays! Yooohooo! They had a great afternoon today at school with hay rides and pumpkin painting. As 5th graders, they "ran" the event. It was very cool. 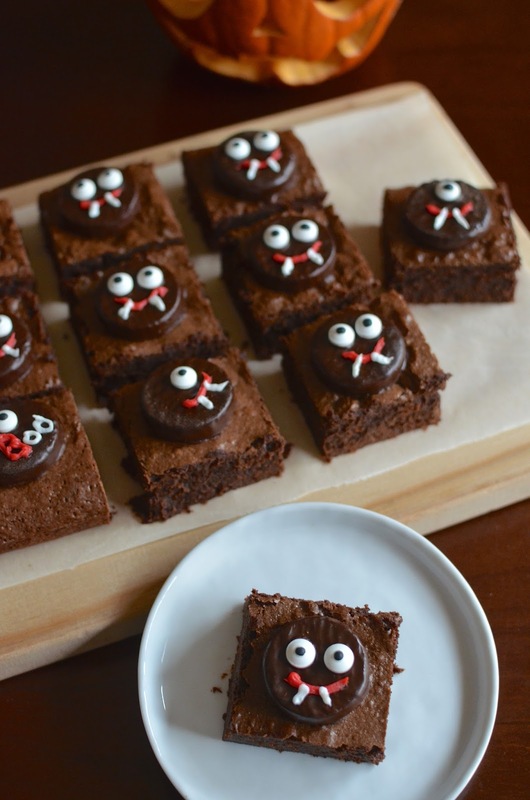 Gosh, these brownies totally win the prize for cutest Halloween treat ^_^ Looks delicious! Hi Monica, I just know we are always going to see a wonderful holiday dessert from you every time. These are adorable, your son must feel very special. My desserts are pretty plain and simple, and that works well for me. It just usually involves a lot of chocolate and that also works very well for us! : ) Thanks, Cheri. Your halloween spirit inspires me, Lorraine. : ) Happy Halloween!!! I love your recipe. These brownies are so so cute! Happy Halloween Monica! You are so sweet, Kelly! Thanks - it was a very busy day yesterday but a good day overall! : ) Hope your little ones enjoyed all the festivities. Are they over-loading on the candy/chocolate?! Adorable brownies! I'm sure they were a huge hit. Thank you, Beth. Hope you had a nice Halloween! What an awesome mom you are! Your brownies are so cute!